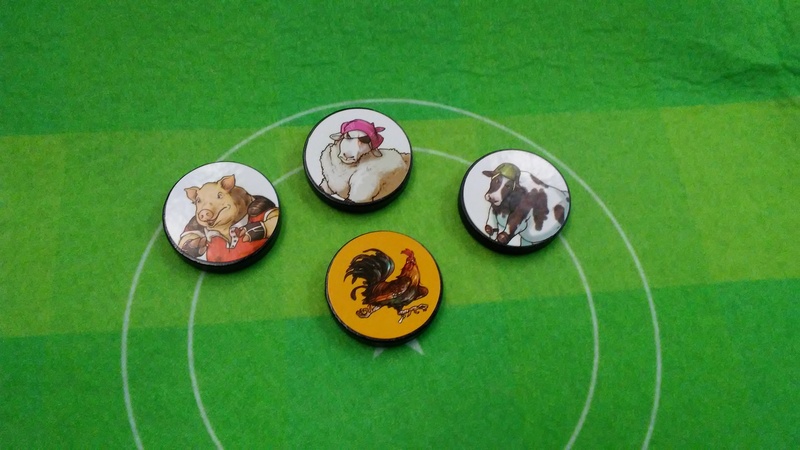 Zoo Ball is a game by Duncan Molloy, published by Osprey Games. It is for 2-4 players. 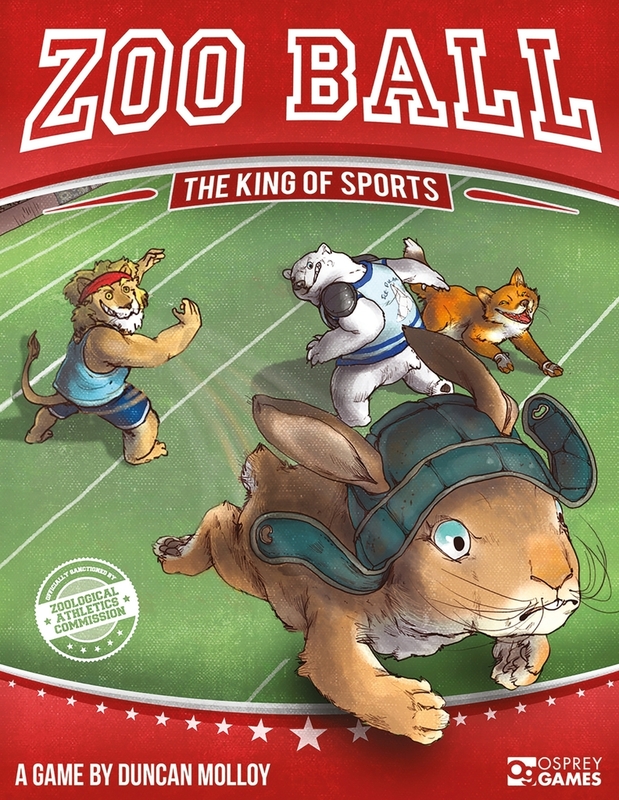 In this game, players will take control of a team of animal atheletes as they compete to be the pride of their city in what has been called the King of Sports. They will be positioning their blockers as they go for the goal. In the end the player that can scores a certain amount of points first will be declared the winner. To begin, each player will take 3 blocker pieces and 1 scorer piece of the same color. The play mat should be placed on the table and laid as flat as possible, making sure that there are no bumps in it. The first player is chosen. Based on the number of players, either 2 or 3-4, players will place their pieces in a formation on the mat. In a 2 player game, the first player places their pieces anywhere on their side of the halfway line, in any type of formation. The second player then places theirs in response on their side. In a 3 or 4 player game, players will simultaneously place their pieces inside the semi circle of their chosen color’s goal in any formation. Pieces may be over the line, as long as the piece is still touching the line. Play now begins. On a player’s turn, they will have the choice of either moving their scorer or all 3 of their blockers. Of course, they don’t have to move all 3 blockers. They have the option of not moving as many as they would like. Moving a piece is done by either flicking or nudging the piece with only 1 finger. If the piece happens to go into the side line, it is moved directly back into the playing area as close to where it went out as possible. In a 2 player game, if it goes out on the opposite side of the mat, it is placed on the player’s side of the field in line with where it went out. It’s a bit different for a 3 or 4 player game. In these games since the player’s scoring goal is at the opposite corner of the mat, if the piece goes out on either of those 2 sides closest to that goal, it is placed at the equivalent point on the opposite side. The object of the game is to get your scorer piece fully inside the opposite goal. In a 2 player game, the first player to score 3 points is the winner. In a 3 or 4 player game, the first player to score is the winner. There’s not a whole lot to this game. To begin with, there’s the large fold out play mat. It seems to be made of felt and has a soccer style layout printed on it. It’s actually quite large. The game also comes with some good size wooden discs in 4 different team colors. There are 4 of each team color. Also included is a sheet of stickers to be placed on the discs. These are somewhat themed and there are plenty of animals to choose from. As a matter of fact, there are 2 extra team’s worth of stickers. I like that you have somewhat similar animals that you can use for a team. For instance, there’s a chicken scorer with a pig, cow and sheep blockers. My twisted brain had already come up with a name for this team; the Barnyard Brawlers. Ok, I’m trademarking that so don’t steal my idea. Anyway, the pieces all look good. My kids like the different animal designs and have fun picking out a team. I like the overall look and feel of them. Really well done. The rulebook for this game isn’t all that complex. It’s only a couple of pages. However, it’s thematically cool. It’s like there are a couple of animal sports commentators explaining the rules and giving their thoughts on things. It’s actually quite fun and silly. There’s some really nice looking art and pictures on these pages. There are even a few examples to help you understand the game. Everything is easy to read and easy to understand. You should have absolutely no problems whatsoever with this book. Overall, the book does a great job explaining how to play both the 2 player head to head game and the 4 player rumble. I think they did a great job here. When I was in high school, we used to fold up pieces of notebook paper to make a paper football. We would sit there and play with that football during recess, at lunch and while waiting for the teacher to start class. I have a lot of fond memories of those times. That brings me to the game. This game takes me back to those days of paper football games but in a much nicer and cooler looking format. Granted, the game is actually more like soccer than football, but the premise is still pretty much there. Knock the football, or in this case your scorer, into the scoring zone. It’s as simple as that. However this game allows you to throw out some blockers to keep your opponent from scoring and it allows the opponent to have their own blockers and scorer. This allows for a bit more strategy than the old paper football we played. If you play with 3 or 4 players, there’s even more chaos on the field with even more blockers and scorers. Pieces are flying all over the place and it can be a bit daunting. No wonder you only play till someone scores. Overall, the game is quite quick and simple to play. It’s easy to teach and is one that even the kids can enjoy. Fans of dexterity games like the old paper football, should really enjoy this one. I would recommend giving this one a try. My kids and I enjoyed playing it. Zoo Ball is a dexterity style game of soccer. It’s a fairly quick game to play. Most game sessions last around 20 minutes. The art style and components are all really nice. My kids and I enjoy the many different animal designs. The game isn’t hard and can easily be taught. There is a little bit of strategy especially when playing with more players. That makes this a great game to play with your kids and family. It reminds me of the old paper football game we used to play growing up. Fans of dexterity style games should enjoy this one a great deal. I would recommend giving it a try. You just might score a winner.